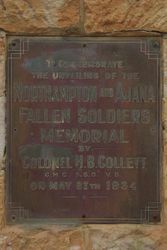 Northampton War Memorial Gates were erected to commemorate the unveiling of the Northampton and Adjana Fallen Soldiers Memorial in 1934. 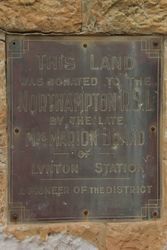 A plaque on the gate pillar also states that the land was donated to the Northampton RSL by the late Mrs Marion Brand a pioneer of the district. The Northampton Suh-branch of the R.S.L recently completed the erection of ornamental gates at the entrance to the memorial grounds at that centre, and on the occasion of the recent visit of the Director of Education (Mr. J. A. Klein) opportunity was taken to have the gates officially opened. The ceremony took place on Friday of last week in the presence of a representative gathering, members of the Boy Scouts, Girl Guides, Cubs and Brownies together with a number of ex-service men forming a guard of honor on both sides of the gates. An interesting address was delivered by Mr. Klein, who said he was extremely pleased to have the honor of declaring open such beautiful gates erected in conjunction with a memorial that was a tribute to fallen sailors and soldiers. Moreover, he was also pleased to learn that the gates had been designed by a former Northampton scholar in Mr. Marshall Clifton. The erection of the gates marked the third stage in the building of a memorial of great beauty and durability, and he hoped that the work would be continued until the park was wholly completed according to plan. Geraldton Guardian and Express (WA), 22 August 1936.